Jean-Francois Millet is considered by some to be one of the 100 most influential painters of all time. And, yet, like so many of the artists on that list; his work did not sell well during his lifetime. Alfred Sensier, biographer and friend of Millet, admitted to resorting to a bit of deception, at times, to gain the artist commissions. Millet’s work was often seen as that of a failed partisan, he had joined the fight on the barricades of the revolution but did not truly believe in the cause instead wanting to simply be permitted to paint his peasants. It was those peasants, typically shown performing laborious tasks, that some saw as not-so-subtle representations of the plight of the poor and they were seen, by some, as being disloyal to France. Sensier hid the name of this work and that of the artist when he asked M. Romieu’s secretary to hang it in the Director of the Beaux Arts’ office. It was universally admired. Ironically, it was Paul Delaroche, Millet’s one-time teacher, who would change things. Delaroche had earlier recognized Millet’s artistic talents but did not particularly understand his protege’s incorporation of toiling peasants on an otherwise acceptable landscape painting. “A peasant named Francois Millet” was the answer. Such high praise led to a much needed commission of 600 francs for Millet. As best as I can tell, the painting here matches the story told by Sensier. I hesitate in emphatically stating that this work is one and the same since the Boston Museum of Fine Arts suggests that this particular painting was “probably commissioned by Paul van Cuyck, Belgium.” But, the dates and description do seem to match. Millet painted a number of pictures of women sewing, but this is the only one I found that depicts more than one woman. There are a few of a woman teaching a child to sew but it seems unlikely that Sensier would refer to one of those as “Sewing-Women”. 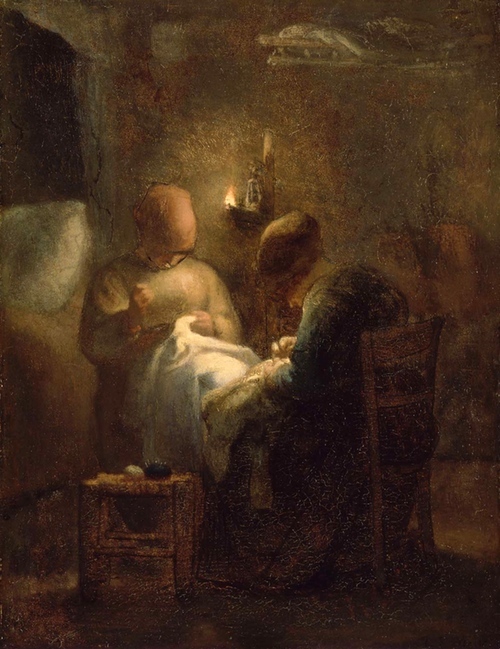 The Museum calls this painting Women sewing by Lamplight (La Veillée).